Did you know that there's a National Chocolate Chip Cookie Day? It's May 15th. I didn't know such a thing existed until someone mentioned it to me in passing on May 14th. Naturally, I decided I had to celebrate. I thought long and hard about which recipe I'd like to bake up because working where I work, you have to know that 10 other people are going to bring in cookies and they will be fantastic. Being competitive by nature, I wanted to bring in something unique and delicious all at the same time. So I took to the web to see what was out there. I've made quite a few versions of chocolate chip cookies. I've made thin-and-crispies, sea salted, espresso infused, soft-thick-chewies, walnuties and everything in between. But I've never made them with whole wheat. Light bulb. 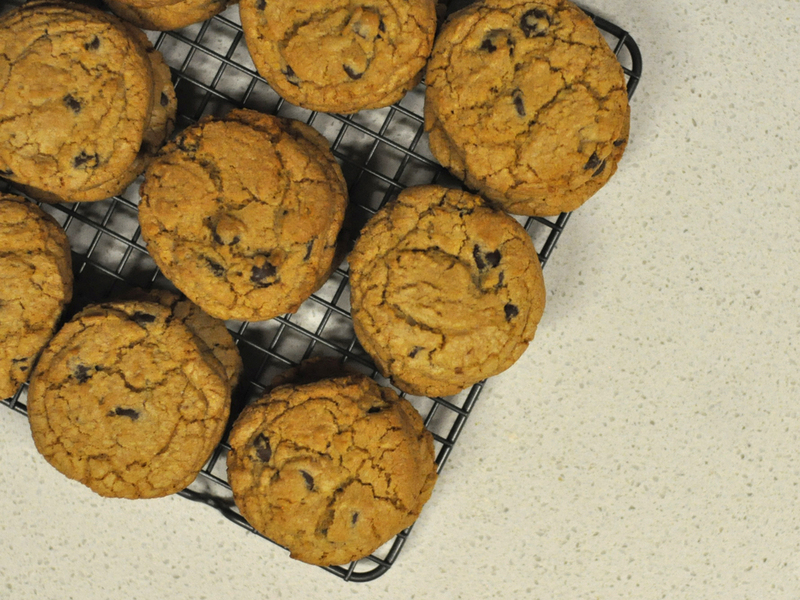 Kim Boyce's Whole Wheat Chocolate Chip Cookies are different enough to be interesting while classic enough to be comforting. They're chewy on the inside, crispy on the outside, nutty and hearty all rolled up into one. Full disclosure, I don't believe these are stand alone cookies. I think they're perfect companion to your morning cup of coffee or afternoon tea. They remind me of digestive biscuits. They're super popular in Europe. Are they popular in the States? Well, anyway, these cookies are like that but better. And I know they aren't necessarily healthy but that nutty, hearty flavor makes me feel like they're totally ok to eat for breakfast, after lunch and maybe for dessert with a scoop of homemade vanilla ice cream!? So here we go with the recipe, unedited, followed exactly, because I know you're dying to make a cookie that can be eaten at any time of the day with little to no guilt (they're whole wheat so they're healthy right?)! Place two racks in the upper and lower thirds of the oven and preheat to 350°F. 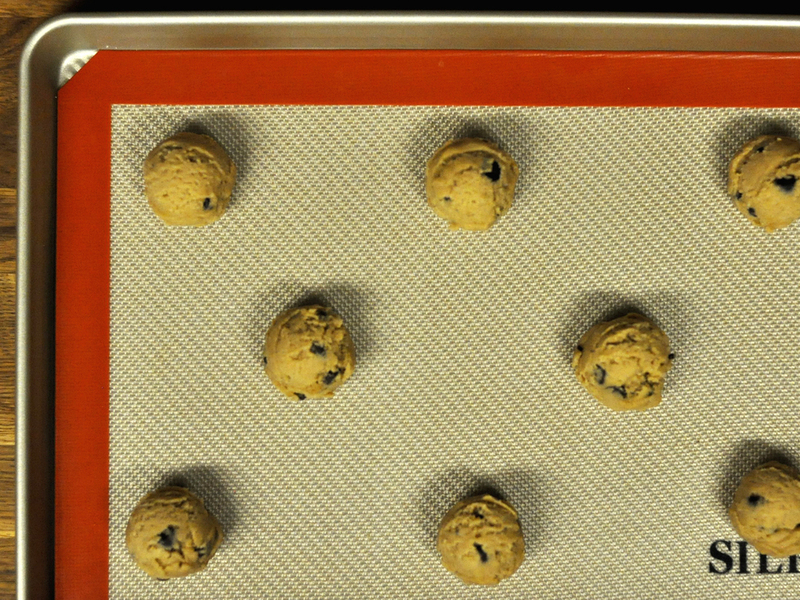 Line two baking sheets with parchment. Add the butter and the sugars to the bowl of a standing mixer fitted with a paddle attachment. With the mixer on low speed, mix just until the butter and sugars are blended, about 2 minutes. Use a spatula to scrape down the sides of the bowl. Add the eggs one at a time, mixing until each is combined. Mix in the vanilla. Add the flour mixture to the bowl and blend on low speed until the flour is barely combined, about 30 seconds. Scrape down the sides and bottom of the bowl. Note: These cookies are best eaten warm from the oven or later that same day. They'll keep in an airtight container for up to 3 days.